Understand why it is important to make note of missing data values. Be able to define what a NA value is in R and how it is used in a vector. 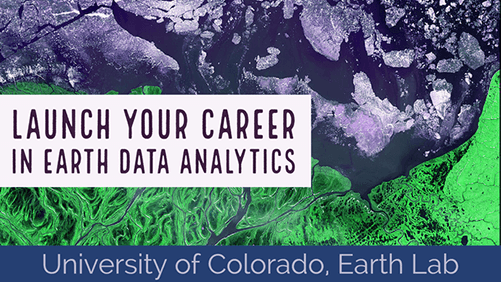 In this lesson, you will learn how to handle missing data values in R using readr and some basic data exploration approaches. Sometimes, your data are missing values. Imagine a spreadsheet in Microsoft Excel with cells that are blank. If the cells are blank, you don’t know for sure whether those data weren’t collected, or someone forgot to fill them in. To indicate that data are missing (not by mistake) you can put a value in those cells that represents no data. 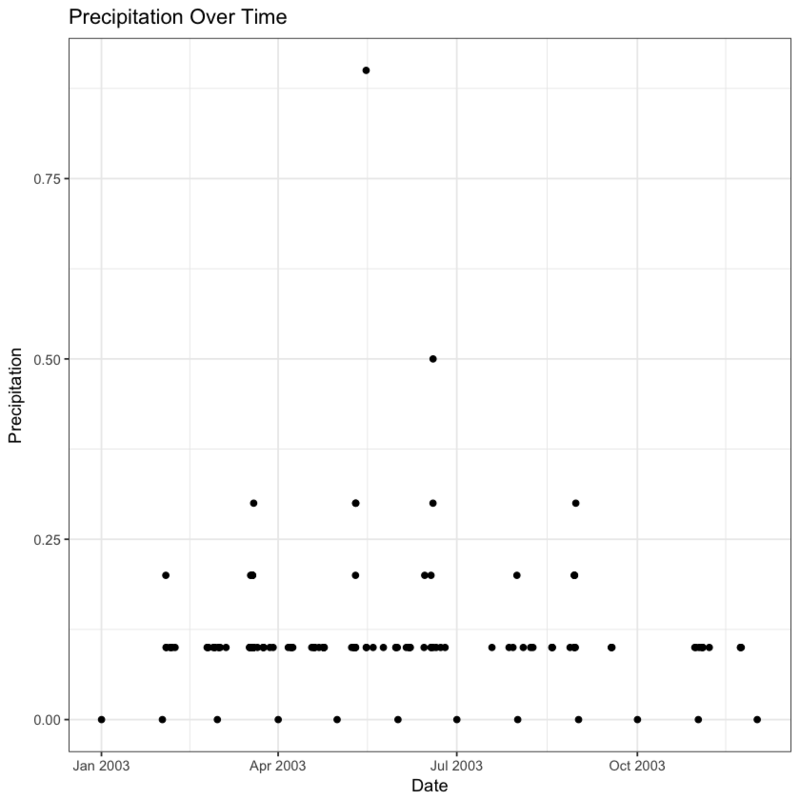 The R programming language uses NA to represent missing data values. ##  "0"       "0.2"     "0.1"     "999.99"  "missing" "0.3"     "0.9"
Next, we can create a vector of missing data values. We can see that we have 999.99 and missing as possible NA values. Once you have specified possible missing data values, try to plot again. Removed 3 rows containing missing values (geom_point). 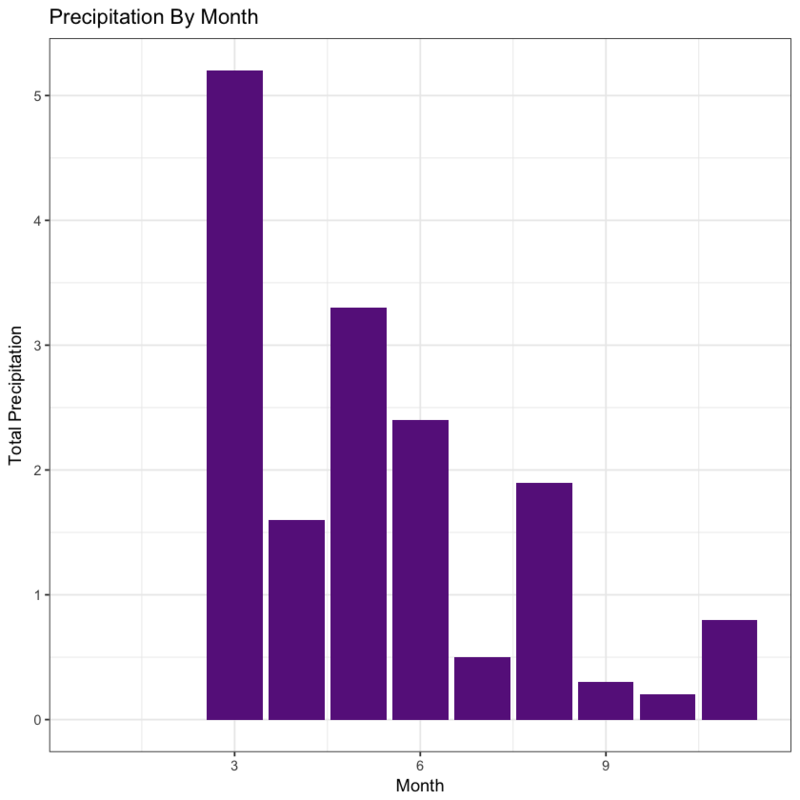 Create a plot that summarizes total precipitation by month for the first csv file that we have worked with through this lesson. Use everything that you have learned so far to do this. ## Warning: Removed 2 rows containing missing values (position_stack).